Children and youth represent one-third of the world’s population, and in some countries, especially emerging markets, they can constitute almost half of the population. With limited access to formal-sector financial services, children can be particularly vulnerable to economic shocks and to resorting to informal money lenders or potentially abusive and exploitive situations to bridge the financial crisis. What little products that do exist for children are not always designed to address their unique needs and challenges. Child & Youth Finance International (CYFI) aims to change this by advocating a new approach that encourages financial institutions to consider children’s rights when developing financial products and services targeted towards youth. In collaboration with UNICEF and with support from MasterCard employee volunteers, Anna Zanghi andJennifer Rademaker, CYFI developed a discussion paper “Beyond the Promotional Piggybank: Towards Children as Stakeholders” outlining a framework and a five-step process to help mainstream financial institutions develop inclusive, safe and responsible products for children and youth. 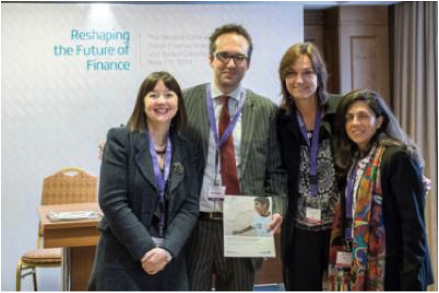 The paper received positive feedback at the Second Annual Child and Youth Finance International Summit held in May 2013 in Istanbul, where Jennifer and Anna shared CYFI’s recommendations with senior level representatives from a variety of financial and youth-focused organizations.